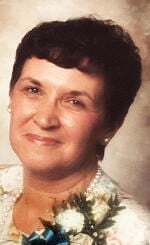 Beloit, WI -- Beverly A. Westwood, age 81, passed away on Tuesday, April 9, 2019 at The Green Knolls Nursing Home (formerly Beloit Health & Rehab) Beloit, WI. She was born August 22, 1937 in Tomahawk, WI, the daughter of Russell and Mabel (Mattson) Barnes. Beverly graduated from Beloit Memorial High School in 1955 and continued her education at Swedish American Hospital School of Nursing graduating in 1959. Beverly married Joseph J. Westwood Jr. on December 4, 1959 at Grace Methodist Church in Elgin, IL. She was employed as a nurse at Beloit Memorial Hospital, the Beloit Clinic and Beloit Health Department until her retirement in 1998. Beverly also loved to get her hands in the dirt in her garden and read. She will be remembered for her wonderful sense of humor. She is survived by her husband, Joseph; her three children: Kari (Michael Dzieciolowski) Westwood of Wake Forest, NC, Joseph J. (Kathi) Westwood III of Bloomingdale, IL, and James W. (Heather) Westwood of McHenry, IL; grandchildren: Kathryn (Stephen) Seese, Shawn (Jackie) Phetteplace, Joseph J. Westwood IV and Sarah Rose Westwood, Riley Westwood and Emma Westwood; great grandchildren: Travis, Zachary and Josephine Seese and Charlie Phetteplace; and nieces and nephews. She was preceded in death by her parents; her brother, Edwin Barnes; and her sister, Gloria Foster. Beverly's Funeral Service will be at 12 Noon on Saturday April 20, 2019 in the ROTARY BOTANICAL GARDENS, 1455 Palmer Drive, Janesville, WI, with Rev. Daniel Eddy officiating. Friends will be received on Saturday at Rotary Botanical Gardens from 10:30 a.m. until the time of service. In lieu of flowers, a memorial is being established. Please share a memory or a condolence with the family on our website, brianmarkfh.com.